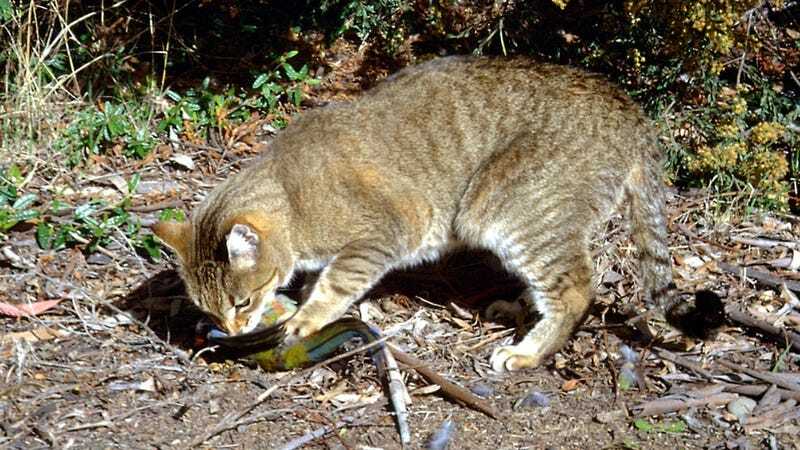 Australia has a kitty problem, and it’s not “the cat scratched up the couch.” It’s that feral cats roam 99.8 percent of the country—cats cover more Australian land than internet access does. To alleviate the problem, officials from Parks Victoria are, uh, feeding the cats KFC. But some don’t think the spending was justified. On Monday Victoria’s environment minister, Lily D’Ambrosio, announced an external auditor would undertake an independent review of Parks Victoria’s credit card transactions over the past four years. The investigation was prompted by a large number of credit card transactions and credit cards available to Parks Victoria staff, the minister said. A nameless source also told the The Guardian that “KFC is widely known to be the most effective bait for luring feral cats,” which is honestly incredible. Like, possibly the most incredible quote ever reported by the news media. Anyway, this would normally be fine—Victorian scientist Alan Robley from the Arthur Rylah Institute for environmental research in Victoria told The Guardian that fried chicken made a good lure thanks to its “scent and prolonged freshness.” But the audit found that parks employees also spent hundreds of dollars on jewelry, mountain bikes, and other things probably not used for park upkeep, as well as five thousand dollars at a home entertainment store. The total credit card bill came to $2.2 million dollars. It is awesome that feral cats like KFC, although Popeye’s is obviously better (fight me). It is not awesome that Australian parks might be using taxpayer money to buy themselves mountain bikes. Update 6:36PM EST, 1/11/2017: Lachlan Quick, manager of media and communications at Parks Victoria, emailed Gizmodo with the context surrounding some of the purchases. ﻿1. No alcohol is permitted to be charged to Parks Vic credit cards. 2. The cards have been used to replace petty cash- which is much less accountable. 3. The jewellery you mention was for restocking our gift store in the Dandenongs (you only have to ask- it’s at the National Rhododendron Gardens- I have the invoice with me). The mountain bikes were likely a work expense as well in order to navigate the parks system, said Quick. But it’s up to the planned external audit, not us, to determine whether the $2.2 million mentioned above was justified. Correction: This article previously read “But also maybe embezzling public money.” The wording has been updated to “But some don’t think the spending was justified,” so as not to imply that a charge was filed.